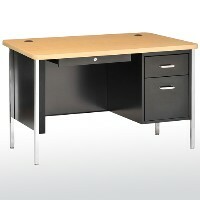 Teacher Desks are great for instructors who need more elbow room and storage in the classroom. US Markerboard offers Teacher Desks with Drawers and comfortable Computer Chairs for long days of grading. Desks with File Drawers make great headway for teacher desk organization ideas. Also, the Overhead Storage for Teacher Desks gives you plenty of Teacher Desk organization ideas! It includes Lighting for Desks or Tackable Board for Desks! For more Teacher Desk Organization, there is a Book or Tablet Holder for Desks that can keep track of what class you�re teaching each period! Modesty Panels on Desks lend some privacy to teachers and conceal wires from computers. For more wire management, there are Teacher Desk Accessories that include Wire Chases. Make moving Furniture easy when you use Desks with Casters that can lock into place! If you aren�t moving the Desk far, Teacher Desks with Gliders make them easy to move around the classroom. Having a specialty Desk for teachers is important for organizing a classroom and having room for several classes� worth of lessons. Choose from Oak Teacher Desks or Metal Teacher Desks and Teacher Desks with a Slide-Out Table Attachment. Ergonomic Teacher Desks pair well with Ergonomic Office Chairs and Anti-Fatigue Carpets for full comfort and health in the classroom. They make the days not seem so long!